Alanya is a beach resort city and a component district of Antalya in Turkey. It's 166 kilometres (103 mi) from the city of Antalya. 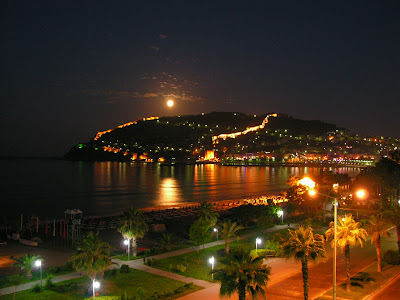 Alanya has an area of 1,598.51 km2 and (2010 Census) 248,286 inhabitants (city 98,627). Alanya is also home to around 10,000 European residents. 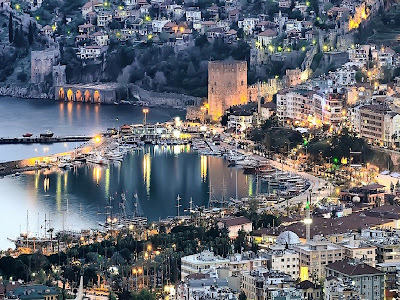 Alanya's greatest political importance came in the Middle Ages, with the Seljuk Sultanate of Rûm under the rule of Alaeddin Kayqubad I, from whom the city derives its name. His building campaign resulted in many of the city's landmarks, such as the Kızıl Kule (Red Tower), Tersane (Shipyard), and Alanya Castle. Alanya has a typical Mediterranean climate. 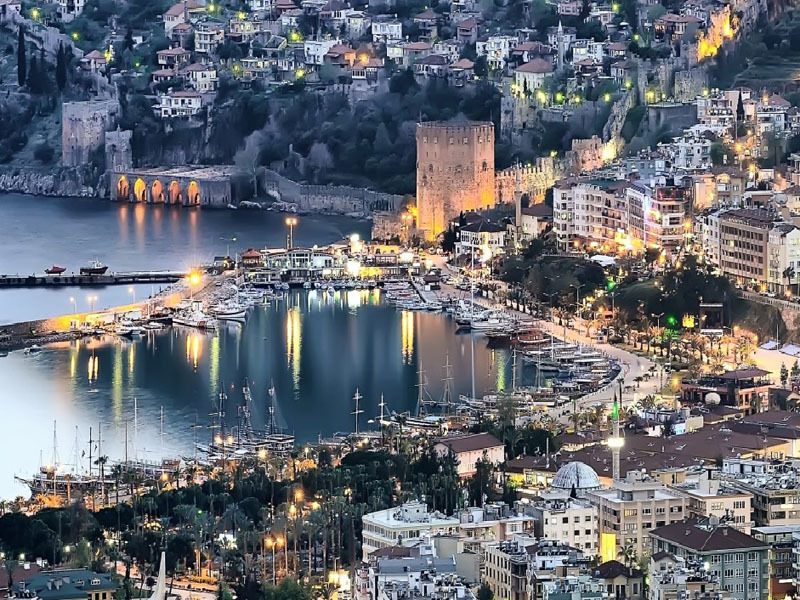 The Mediterranean Basin ensures that most rain comes during the winter, leaving the summers long, hot, and dry, prompting the Alanya board of Tourism to use the slogan "where the sun smiles". Storm cells sometimes bring with them fair weather waterspouts when close to the shore. The presence of the Taurus Mountain in close proximity to the sea causes fog, in turn creating visible rainbows many mornings. The height of the mountains creates an interesting effect as snow can often be seen on them even on hot days in the city below. The sea at Alanya has an average temperature of 21.4 °C (71 °F) annually, with an average August temperature of 28.0 °C (82 °F). The Alanya International Culture and Art Festival is held in the last week of May, and is a notable Turkish festival. Other regular festivals include the Alanya Jazz Days, which has been held since 2002 in September or October at the Kızıl Kule, which is otherwise home to the municipal ethnographic museum. The Jazz Festival hosts Turkish and international jazz musicians in a series of five free concerts. Atatürk's visit to Alanya is also celebrated on its anniversary each February 18, centered on Atatürk's House and Museum. The Alanya Museum is home to archaeology found in and around the city, including a large bronze Hercules statue, ceramics, and Roman limestone ossuaries, as well as historic copies of the Qur'an. European residents of Alanya also often celebrate their national holidays, such as Norwegian Constitution Day, and the city set up a Christmas market in December 2010. The D 400 Highway, the Alanya–Mersin Route, connects Alanya from the east and west, encircling it, and linking through the city center via Atatürk Bulvarı. The D695, the Ankara–Akşehir Route, runs north–south and reaches the sea 41 kilometres (25 mi) west of the city near Side, connecting with the D400. Antalya Airport is 121 kilometres (75 mi) away and connects internationally. The new Antalya Gazipaşa Airport, first begun in 1992, is only 14.5 kilometres (9.0 mi) from the city, and was expected to have its first regular domestic flights on May 22, 2010, although international flights were not expected before the start of the 2011 tourist season. There are bus and dolmuş systems out of Alanya's two bus depots, but buses are usually limited to the major roads, and inside the city transportation is by car, taxi, or foot, as many roads in the old town are closed to vehicle traffic. 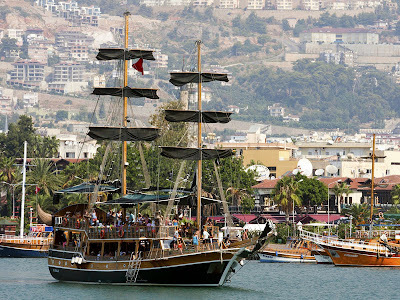 The harbor includes cruise ship piers, and also seasonal ferries and hydrofoils depart for Kyrenia in the Turkish Republic of Northern Cyprus.Further west of the city is the Alanya Yacht Harbor, a marina, which started services in 2008. The 85-km2 (33-sq-mi) marina allowed Alanya to participate in the 2008 Eastern Mediterranean Yacht Rally. Alanya is also investing in a community bicycle program with 150 bicycles and twenty terminals. The castle has a castle wall of 6.5 km length, 140 towers, about 400 cisterns, doors with inscriptions and as an open air museum reflects Seljuk art at its best, showing the fascination of Seljuk art. The castle was built by A. Keykubat, the Sultan of Seljuk. The ramparts start from Kızkule, extend down from Ehmedek, İçkale, Adam Atacağı, Cilvarda Burnu, Arap Evliyası Rampart and Esat Rampart and pass through Tophane and Tersane and end at Kızılkule at the starting point. The first construction the castle dates from the Hellenistic Period, but in fact the construction took its fascinating and monumental form during the Seljuk Empire. The altitude of the part called the inner castle and located at the highest place of western corner of the peninsula is about 250 meters. It was surrounded by walls from four sides as it was the centre of administrative and military organisation. Two Seljuk period cisterns made of bricks located in the middle part of the inner castle are still in good condition at present. Main buildings in the inner castle were constructed so as to lean on the castle walls, except for the western part. Sultan Keykubat has been built his palace here...The settlement in the castle continues also today. İn front of wooden and stone made houses, silk and cotton are woven, different figured calabash trees are coloured,otantic food has been served in little gardens. Further, on the road to the castle restaurant and cafes are located on the sea side. The castle road is open to vehicle traffic. You can also walk to it in circa one hour. Located on the seaport. This grand building erected in 1226 for military and dockyard control purposes is one of unique monuments of the Seljuks, and is the symbol of Alanya with its octagonal figure. İn 1226, The Sultan of the Seljuk’s, Alaaddin Keykubat, ordered the builder of the Sinop Castle craftsman Ebu Ali Reha el Kettani from Halep to build the tower. İt was very difficult to carry the stone blocks to the top of the tower during construction, therefore the top was built of red bricks and accordingly was named Red Tower. Some walls of tower was made of ancient marble. The tower has octagonal planned towers of each 12.5 mt wide 33 mt height and a diameter of 29. İt’s has 5 floors including the ground floor. The top can be reached by big stone stairs.The sunlight reaches from the top to the first floor. There is a cistern in the middle of the tower. The tower was built against the attacks to the harbour and the dockyard and was used centuries for martial targets. After repairs between 1951 and 1953, the first floor of the building functions as ethnography museum. İt began to be built in 1227 and finished in one year, near Kızılkule (red tower) six years later after the Seljuk’s Sultan A.Keykubad controlled the city. The sea side of the dockyard with five arch parts has a lenght of 56.5 mt and 44 mt deep.The dockyard is located on the most sunny place to take advantage of sunlight. The tablet in the entry of the dockyard carries the emblem of A.Keykubat and it is enriched with rosettes.Alanya’s dockyard is the first dockyard of the Seljuk’s on the Mediterranean Sea. Keykubat who ordered to build the Sinop Dockyard, named later as the “Sultan of the two seas.” In one part of the dockyard is the small mosque, on the other side the room of the guards. İn one of the archs is a well dried in course of time. entry is free to the dockyard which can be reached from the sea with boats or by walk. It was rebuilt and began to be known as the "middle castle" during the Selcuks' Era, replacing the little one on the northern Side of the citadel left by the Byzantine Empire. It's clear from the inscription on its front door that it was built in 1227. It's thought to have been named after the master builder "Ehmedek" of the Selcuks' Era. The middle castle consisting of two parts with three towers is located on a strategically important place and at the same time it can protect the inner one where the Sultan's palace is. The walls of the towers we can see today were built during the Byzantine Era, carving rocks. The three cisterns in the middle castle are still used today. 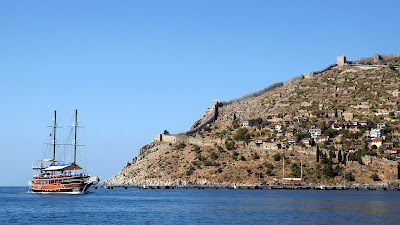 There are pictures of ships on the walls dating back to Selcuks' period. It's in the citadel, near The Süleymaniye Mosque. It's thought to have been be built in the 14th or the 15th century during the Karamanoğulları period as a bazaar or an inn. It's a rectangular building made of stone blocks. It has 26 rooms and a courtyard that is 35 metres long and 13 metres wide. Today this historical building is used as a hotel, a restaurant and a cafe. The shops of the medieval times, overlooking the courtyard are now redesigned as hotel rooms. There's a big cistern at the end of the stairs in the garden. The garden overlooks the above walls on one side, and the Taurus Mountains, the Mediterranean and the beach on the other side. Bedesten can be visited with the permission of the person who runs it. They are the buildings on Cilvarda Bay that has bluffs, nearly 400 meters long and they are at the end of the peninsula. Although known as "the Minting House" in public, those buildings made of stone blocks have never been used for issuing money. One of the stone buildings of the 11th century is a little church and the others were possibly used as monasteries. The dome of the little church has remained standing. There's a cistern on the rocks. Although there's a passage of steps carved in the rocks from İçkale to Cilvarda Bay, it can't be used today. As for sea transport it is difficult and dangerous. It's in the citadel northwards of Bedesten and nearly 100 metres past Süleymaniye Mosque. "God Knows the secrets of earth and heavens. Small mosques of God are only built by those who believe in Him and in doomsday. It was built in 1230 when the great Sultan Alaaddin Keykubat reigned, by poor Akbeşe, who needed God's compassion." There's a cylindrical minaret made of bricks in body on the base of rubble stones, a few metres far from the small mosque. It's in Tophone district. The mosque named so because of a tree called elecampane nearby was built in 1277 by Emir Bedrüddin. It has some characteristics peculiar to the architecture of the Selcuks period. It's made of stone blocks and has a minaret which is not high. Its pulpit is one of the finest examples of Selcuks art of carving wood. You can go to the mosque through the door below, near Kızılkule.minaret that ends with a balcony has an interesting look. It's on a rock on the way to the citadel. It's thought to be of the Selcuks or Ottoman period. It is square in shape and consists of two rooms., there is a long sarcophagus and the other room is empty. Evliya Çelebi wrote that the building was a lodge of Bektaşi Dervishes, we have no certain information about Sitti Zeynep. The name of the pious foundation of the tomb was Sitti Zeynep Gin't Zeynül Abidin" in that foundation's records of the Ottoman Empire during Kanuni Sultan Süleyman period. Three tombs, two meters long each, were carved in the rock where the tomb is situated in the antique era. Antique tombs were once used as water tanks.. The church that is thought to have been founded on a slope overlooking the Mediterranean at the beginning of the 19th century is used for worshipping by Christian and Muslim visitors today. It is rectangular in shape, its roof is built of brick, its walls are made of stone and it has a little apse. There's a mezzanine floor wooden decorated in the church. The frescos on the walls have been detoriated. It's understood from the inscription that the church was repaired in 1873. The inscription being exhibited in Alanya Museum was written in Turkish (the language of Karamans), using the Greek alphabet. The church was closed when the people of Orthodox Church living in Alanya and speaking Turkish, went to Greece because of the exchange in 1924. Hıdırellez Church that has got a water source nearby is also known as the Church of Antalya Kaleiçi. Entrance to ruins is free. It’s a building from the 13th Century, 13 km to the west of Alanya on the highway. The caravanserai was built by Gıyaseddin Keyhusrev the Sultan of Seljuk between the years 1236-1246 on the historical Silk Way. The building which was built on a piece of land about 1000 square metres has walls built of bulky cut stones. The caravanserai which was one of the most important accommodation point of the the middle ages is to be used as amusement centre today. 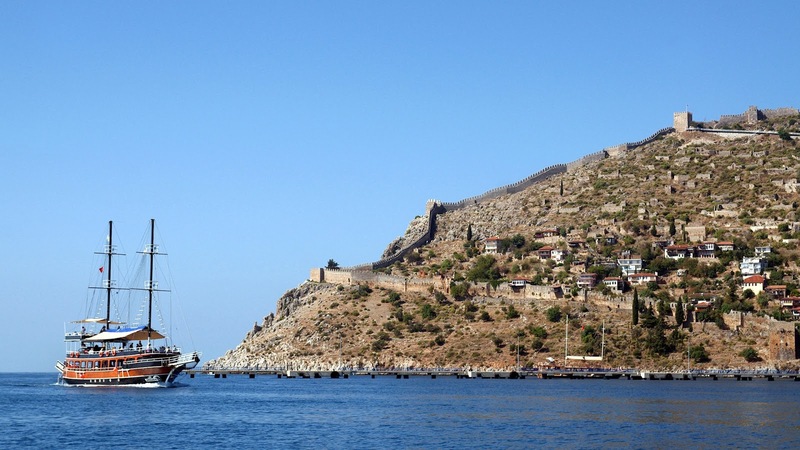 The Citadel of Alara was built in 1232, 37 kilometres westward from Alanya on the demand of Alaaddin Keykubat, the Sultan of Selcuks and it is 9 kilometres far from the sea. The aim of the citadel that was on the Silk Road was to protect the crowds stopped at the inn near the Alara creek. It's built on a steep hill of 200 meters up to 500. It looks magnificent. It consists of an inner and outer part. A dark entrance-hall of 120 steps enters the citadel. It is important to be careful about the wild plants and ruins, since it is not organized as a place to be visited. There are tunnels made by carving rock in the citadel. There is a small palace, the rooms of the workers, a mosque and a Turkish bath in the ruins. Those who would like to go to the top of the citadel through the walls and paths have to climb at least one hour and be equipped properly. However, the view from the top is worth climbing. It’s located on a tableland 800m far away the Citadel of Alara on the Alara Stream. Whole caravanserai has been built of cut bulky stones on a land of piece of 2 thousand square metres. The inn, built in 1231, was restored a few years ago and is to be used as restaurant and shop centre.The warders hut keeps its specialities today. The second door of the caravanserai opens out to the guest rooms. There are small rooms next two sides of the long hall. There is a fountain, a small mosque and a bathhouse in the caravanserai. The signatures of the stone craftsmen which searched out during the reparation are very conspicuous. Keykubat said in the epigraphs in Alanya he was,” the sultan of the land and the two seas, the owner of the Arabic and Persian countries” and in the epigraphs in Alara Inn he got the titles,”The conqueror of Greek, Damascus, Armenian and european countries.” Alara Inn must have been paid for visitting. You can have your meal in the restaurant in the Inn as well as the small eating houses on countryside and you can swim till mealtime. It is in the western part of Alanya, the north of the Kargı creek. We have no idea of the year when it was built since it has no inscription. It is a stone building 46 meters wide and fifty meters long. ItÕs thought to have been used as a caravanserai in Kesikbel, on the road that played a role of a bridge between the Mediterranean and central Anatolia in Roman times, Selcuk and Ottoman Era.